thanks a million for all the helpful suggestions on my plea for help last week! i suppose i was having a mini sewing-related meltdown… i know you all are above such, yes? no?! ha! anyways, i really appreciate the feedback. seriously, you sewing peeps are the best. and, as if you didn’t know… photographing a black dress is super duper hard!!! 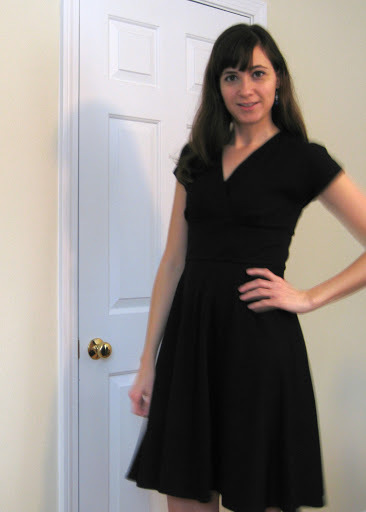 the only changes i made to the pattern itself were to eliminate the neckline and sleeve bands. i have nothing against the bands, but for this i wanted a slightly dressier look. i added 1/2″ to the neckline to compensate for the bands, then serged clear elastic to the edge from the wrong side, then turned and topstitched the edge. i really like how this worked; it gave me a very fast clean finish. for the sleeve hem i turned it in 1/2″ and hemmed before sewing up the side seams. the bodice fit pretty well without too much fiddling. i didn’t crossover the neckline as much as the pattern calls for (my CF notches are about 1″ apart) because it looked so closed up on me. actually my only real disappointment with this pattern (which may not be the pattern’s fault) is that the neckline is too small to lay flat around my neck. i could (and may) widen the neckline slightly to eliminate the wrinkling i’m getting, but i’m going to wear the dress a bit before i go in and perform surgery on it. this pattern has you cut the entire bodice and skirt on the bias, but since i was using a solid color i decided to cut the bodice on the straight (placing the back piece on the fold to eliminate the back seam). based on everyone’s suggestions i left the skirt bias cut. i’m not entirely convinced that cutting the skirt on the bias is necessary to get the nice drape since this is a knit, but i think in the end it helped save on fabric. i had two yards of this fabric which, after washing, was much, much less. i don’t think i could have cut both skirt pieces and the back bodice on the fold. i decided to leave off the pockets partially out of laziness, but mostly because the only things i stash in my pockets are kleenex, not good with black fabric; and my iphone, which would be too heavy and pull at the skirt funny. i do kind of wish i had a place to stash my hands though, i never know what to do with them when i’m not holding a child. i wish i could comment more on the actual pattern sizing, but i do know i would have ended up taking this dress in quite a bit. 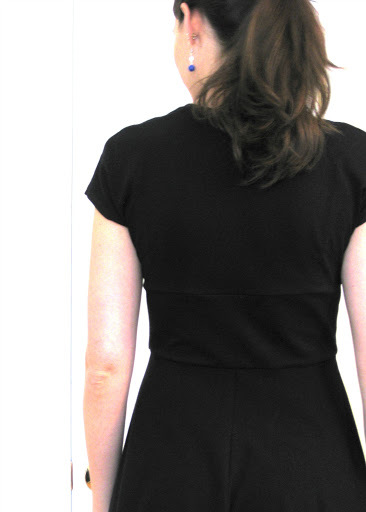 the pattern recommends sizing down for a snug fit and that is basically what my mis-printed pattern gave me. in fact, i think the printing mishap ended up saving me a lot of unpicking and resewing. so i guess that’s a win! my final thoughts: i can really appreciate what steph is doing with cake patterns. the whole multi-sized bodice thing is a fantastic idea and i think she’s really on to something. that said, i just don’t feel the need to fiddle so much with the sizing on a knit pattern. there is a lot of ease built into this dress and i wonder if that just causes more problems than it solves. however i look forward to seeing how her business and patterns evolve; obviously this pattern has been a breakaway hit, and there is no doubt that i really, really love this dress! it checks all the boxes of wardrobe staple, versatile, comfortable, everyday wearable, works with a cardigan… i could go on. i do want to make a stripy version to take advantage of the cheveron effect of the skirt and bodice… in fact this was such a quick dress to sew up i have no doubt that i’ll be making more! 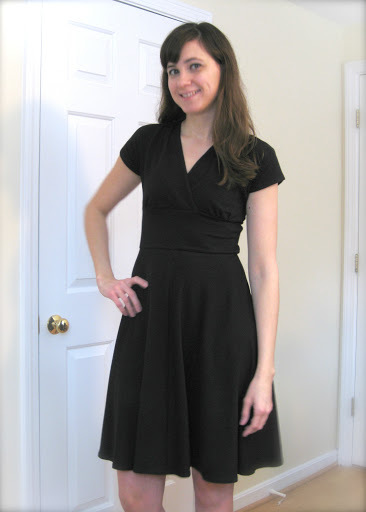 so i have some black cotton lycra from girlcharlee.com that i ordered with the intent of making a knit LBD. a while back an opportunity came up for some free tickets to attend the BSO. i ended up sending my husband because it was cold and i decided against wandering around the streets of boston late at night with two kids. i always get lost and the subway system confuses me… what can i say. i’m from the midwest—i drive places damnit. it also dawned on me that i really don’t have anything appropriate to wear. i suddenly needed a black dress. i’m of an age where i should absolutely have a black dress, but sadly don’t. so i took a gamble and ordered black knit fabric online and thank the heavens it is exactly the weight and drape i wanted. i want to use the tiramisu pattern because it has that right mix of casual if you wear it one way, or dressy if you wear it another. i plan to eliminate the sleeve bands and just hem the sleeves, and will probably eliminate the neck bands in favor of serging some clear elastic to the inside, turning, then topstitching. i’m pretty sure i’ve seen this done with great results, though i’ll test some scraps first just to make sure. so here’s my vent: i went with the .pdf version off craftsy partly to save money, and partly (mostly) because i’m impatient. i’ve done plenty of .pdf patterns so i know what i’m getting into there. i go to print the pattern and it’s 65 pages long. what the what?! wow. that’s a loooooot of pages. now i knew that there are multiple sizes that you customize based on upper bust and full bust measurements, but there’s no good way to print only the bodice size you need. now, i don’t know a whole lot about putting together a .pdf pattern so i’m speaking only from the customer end here, but it would really have been helpful to separate the bodice sizes so you have the option to print only the size you need. i wasted so much paper. i also have a beef with the scaling. my 1″ square comes out to 7/8″. i had tested this with one page and worked out what percentage to print at, but for some reason when i went to print the entire pattern, it didn’t scale. so now i’m stuck with 55 pattern pages that are the wrong scale. i felt so defeated before i even laid out my pages! it was just so much to dig through. basically i’m saying: pay the extra $5 and get the paper pattern. i figured out that the off scale essentially makes my pattern one size smaller. she notes that for a snug fit to go down a size, so this should work out okay? my fabric is really stretchy, and i’ve seen people cut out loads of room from the side and under bust seams. the SA is 1/2″ and i can sew it with 1/4″ SA just for extra insurance. this sounds reasonable, right? okay, last question: the bodice and skirt is cut on the bias, presumably so that you can have fun with stripes. i would really prefer to eliminate the CB bodice seam and the CB and CF skirt seams and cut these pieces on the fold. since i’m using a solid, do i need to cut these pieces on the bias? i just don’t see any obvious reason to. plus i only have 2 yds of fabric so i’m not sure i’ll have quite enough for all the bias cutting. thoughts? lay those opinions on me!! !